Exhaust fans are normally used in Poultry Farms is one of the most necessary component in the mechanical ventilation system. In the facilities of housing poultry and also livestock they work as a driving force that has to provide needed air exchanging system. In the design of a mechanical ventilation system fan selection is the first step which is most important and it is very much needed to choose fans which are performance-tested and also efficient in energy. 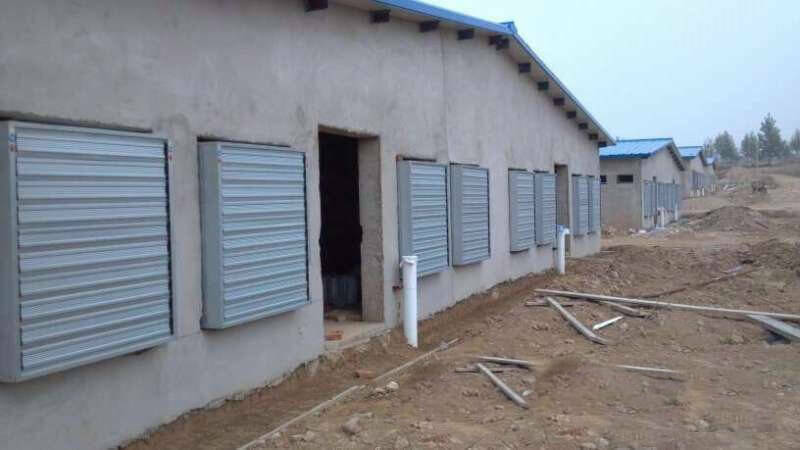 The most important thing that is needed in poultry house is the ventilation system which supplies fresh air to poultry farm and it is also very important to sustain life. High level of temperature, humidity and air contamination can be reduced to tolerable limits for confined the chickens with the help of it. High density of populations of the livestock and poultry farm in confinement is made possible and improved ventilation system. It can be reduced the total building cost per unit of housed. The economically important part of ventilation system can reduce the production and also the labor costs. As long as ventilation which concerned the exhaust fan is must-include part of an exhaust system of the poultry farm. In the enclosed of building where the poultry farm is confined air replacement system is needed. Otherwise it may change air composition. These results can increase the concentration of carbon dioxide, ammonia and many other harmful gases to the unacceptable levels. In the following, Table 1 indicates that the critical and also the desired level of some of the gases which research has shown. Harmful gases and undesirable odors causes the respiration problem and also waste the decomposition is carried the system and brings the oxygen needed to sustain life by changing the air in the building. The system keeps airborne disease and organism at a tolerable level to the bird’s health by diluting them. There are two kinds of ventilation systems: These are: (1) natural air flow system and (2) mechanical air movement (fans). Because of varying the ventilation required to provide comfort to the chickens during the varying climatic conditions at a minimum cost. These two completely different systems are sometimes combined. 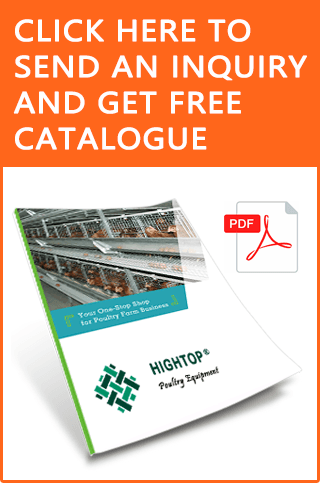 How to Measure the Fan Capacity and Size for Your Poultry? The amount of air of a fan moves depending on the shape of the blades, diameter of the blades, horsepower (hp) of the motor, speed at which the blades turn (rpm), design of the shroud and also other attachments such as louvers. The air moving capacity of a fan is depends on these combined factors. Cubic feet, or volume, of air moved per minute (cfm) fan capacity is measured .We get one of the most efficient and affordable exhaust fan for any size or ant type of chicken poultry, from HIGHTOP Chicken Cage Ltd. To get a farm idea and to know what it needs to ensure the perfect ventilation system that you can have a look on it. When selected fans are for the animal ventilation system, energy efficiency will become an important issue which can expresse as airflow per unit of input energy, or cfm/watt. 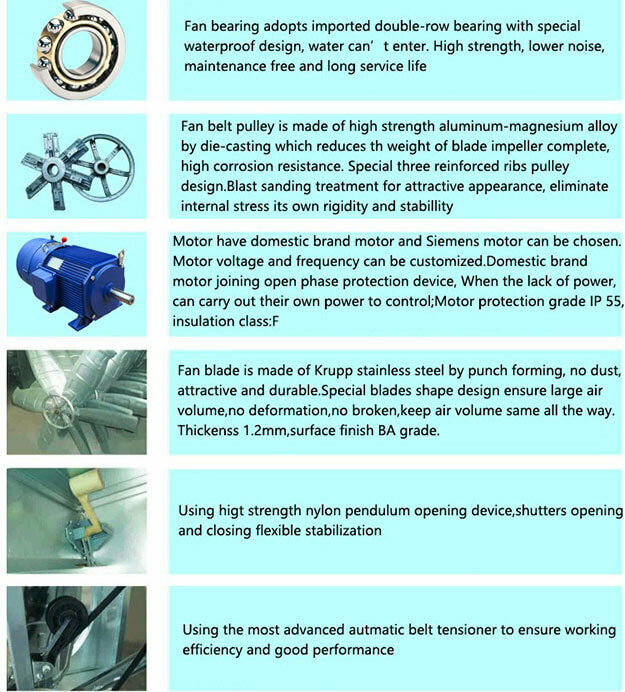 Various fans are manufacturer to tests the energy efficiency of fans. At the University of Illinois The Agricultural Engineering Department, Bio-environmental and Structural Systems Laboratory (BESS) tests the efficiency rate. This tests are done on 36-inch diameter blade fans by this lab which showed a wide range of variation in both energy efficiency (8.3 to 18.6 cfm/watt) at 1/10″ static pressure and fan performance (6,400 to 13,000 cfm). The dimension is supposed to adjust the any type of chicken farm is the proposed as the dimension of HIGHTOP poultry farm exhaust fans. Extreme climate conditions of an area should keep in mind to design this system. The building should be filled with birds to designed the capacity for the system balance. To be protected from rapid deterioration insulation should be of the proper type and installed. You should adjust the ventilation system seasonally and clean it regularly. For extreme climatic conditions supplemental heat and cooling should be provided. Periodical service and good maintenance is needed for all equipment(fans and controls). Good management for the poultry, the building and the ventilation system should be provided. In case of power failure a stand-by electric generating equipment and/or a suitable alarm system should be available. The fans which operate in animal housing units are used to expose to vast amounts of dust, moisture, and accumulate dirt on blades, louvers, and shrouds. Dirt does not affect the fan blades much, but airflow of louvers and guards can be reduced of almost 40 percent of dirt. To prevent a large airflow reductions in fans. Fan louvers and guards can be lubricated and cleaned regularly. Lubrication has to be done using a graphite to prevent the dirt accumulation. To avoid the potential for restricting the airflow louvers should be removed where fans are running continuously but to prevent personal or animal injury guards have to remain in place. Not only the environment in a livestock or poultry barn become dirty but also there are corrosive gases, especially in facilities with the manure pits inside the facility. Fans that are exhaust from pit areas of Continuously running fans need a non-corrosive housing, such as fiberglass, to prevent the deterioration. The control which is done by a simple switch or a microprocessor, should also be protected to the eliminate which have electrical contact and also works as the switch from being exposed to corrosive gases, from the environment, A watertight and dust-tight electrical box. If you need more knowledge about the electrical wiring in corrosive environments, you can check the these “Farm Buildings Wiring Handbook”. This is available from the University of Minnesota Agricultural Engineering Extension office. An essential element for getting the proper performance of any mechanical ventilation system contains enough good quality poultry farm exhaust fans. On the basis of air delivery system in cfm against a 1/8-inch or 1/10-inch static pressure, fans should be selected. These rated energy efficiency also considered. Within a few years, the energy efficient fans will pay for themselves from the electrical energy savings project. To assure the valid ratings look for a reliable testing label when purchasing fans. For required ventilation rate in animal confinement facilities make sure that shutters, louvers and other restrictions are also included when selecting fans. For more on farming tips, poultry farm equipment and other important blog posts, visit our product website and blog. Thanks for informing. Iam in touch with Alisa and am placing an order for chicken cages. I wanted to include fans on the list. Let me study the article and see what to do.